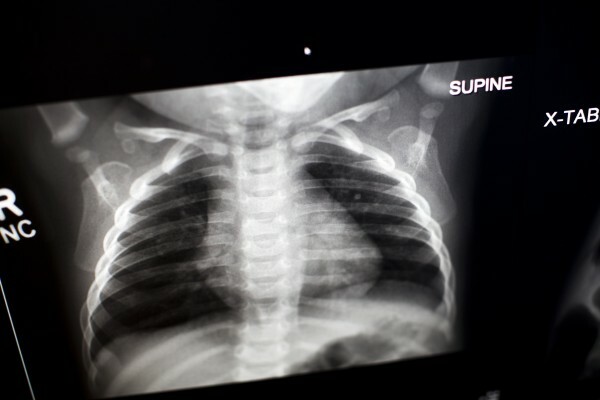 An X-ray is a picture of the inside of your child’s body, and is the most frequently used form of medical imaging. X-rays are painless, fast and easy to obtain. At CHOC Children’s, your child will receive a high-quality and rapid X-ray examination using the lowest radiation dose possible. An X-ray is a test that can take still pictures of the bones and organs in the body. An X-ray is an actual form of energy. This invisible energy beam passes through the body on to a recording plate that creates the image. The X-ray is painless but does produce a small amount of radiation. The radiologist looks at the pictures and uses them to help the doctor diagnose problems. Can an X-ray harm my child? An X-ray is a safe, noninvasive procedure used to diagnose problems inside a patient’s body. The amount of radiation used in most examinations is very small and the benefits greatly outweigh the risk of harm. The radiology team at CHOC Children’s has been trained to use the minimum amount of radiation to obtain the necessary images. The patient is asked to remove any clothing or jewelry that might be in the way with the area of the body to be imaged. The child is positioned sitting, standing or laying in between the X-ray machine and the recording plate for the examination. The X-ray will be taken with a large camera by the technologist. The X-ray camera may come very close to the child to take a picture but it will not touch. It is important for the child to remain still for each image taken. There is no special preparation required for most X-rays. Your child can eat and drink as usual unless you are given specific instructions when you make the appointment. Give your child a simple explanation as to why an X-ray is needed. Bring your child’s favorite book, toy or comforting object to have while you wait. If your child is feeling very anxious about the X-ray, our child life specialists can help ease any fears. Please let us know at the time of making the appointment if you think your child will need a child life specialist. There is no pain associated with having an X-ray. Sometimes your child may be in an uncomfortable position for a very short time, depending on the area being imaged. The benefit of an accurate diagnosis far outweighs the exposure to radiation that occurs during an X-ray. Because children are more sensitive to radiation exposure than adults, CHOC Children’s is dedicated to adjusting equipment and procedures to deliver the lowest possible dose to young patients. We are nationally accredited by the American College of Radiology and follow all guidelines outlined in the Image Gently campaign. Your child will be ready to go home or see the doctor if an appointment is scheduled. The radiologist will provide a report to the doctor who ordered your child’s X-ray. The doctor will then discuss the results with you.